How do split panes in Terminal work? I tried to open a split pane to run another command but instead it displays the same in both panes and I can only interact with one of them. I thought it would split the view so I could use the two panes independently like two windows. I have the Visor installed but I don't think it would interfere. I would add that, for two separate terminals, you can use separate tabs as well. 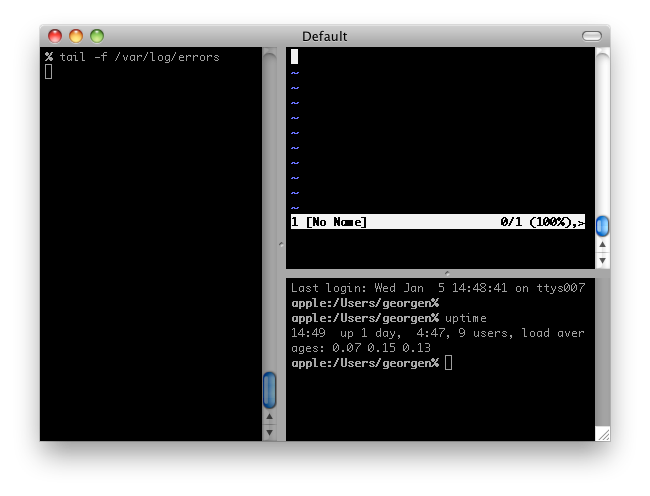 iTerm 2 supports split panes with independent shells in each pane, not one linked shell. Also don't over look tmux. Its like screen but more features I believe. You should really have a look at screen (that´s an already installed command line tool, not a separate application), which gives you the ability to split your Terminal into two (or more) separate ones. I use that with Visor and it works like a charm. Have a look around here, there are quite a few tips on how to use "screen" on a Mac. How to switch or close the new split Terminal pane? How to switch input in split panel terminal?